The River building at Grace Farms. 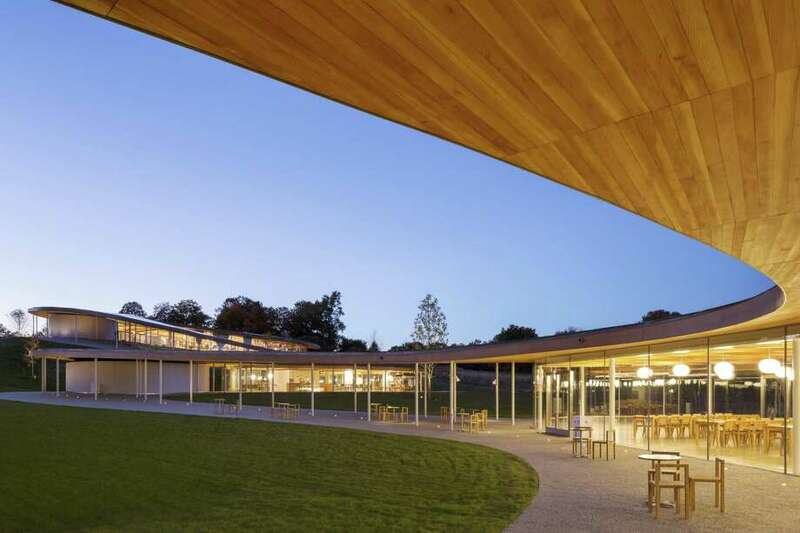 NEW CANAAN — Global and local leaders are coming together at Grace Farms next week to discuss sustainability at the first Regional Convening for Sustainable Development. Co-hosted by the Grace Farms Foundation and Live Green Connecticut, the all-day conference will focus on strategies for sustainable development in Connecticut and feature leaders from around the state. New Canaan’s first selectman, Kevin Moynihan, will be in attendance as a participant and an introductory speaker. The Regional Convening for Sustainable Development will be held at Grace Farms on Feb. 7, starting at 9 a.m.
Tickets are $40 and $20 for students. The prices include lunch. For information and to purchase a ticket, visit gracefarms.org/calendar. Thatcher said the event came about through mutual inspiration between him and Daphne Dixon, co-founder and executive director of Live Green Connecticut, a nonprofit that promotes sustainable lifestyles. According to Thatcher, Dixon attended an Earth Day event at Grace Farms, which inspired a community symposium she held in Wilton. Thatcher in turn attended Dixon’s event in Wilton and ended up developing a working relationship with her. The two later attended an international conference about regional development hosted by the United Nations and gathered further inspiration. “We attended that and said ‘Wow, this is a perfect sort of model of what we need to be able to execute on a regional level and translate global goals to a local level and local awareness,’” Thatcher said. Thatcher and Dixon’s challenge was condensing the three-day conference they attended into a one-day event. The morning portion of the Feb. 7 event will focus on panels and address strategies for sustainable development while the afternoon will feature community breakout sessions attendees can visit at their choosing. Those sessions will feature local businesses, nonprofits and town committees presenting their own work in sustainability. Global and regional speakers include Catherine Smith, commissioner at the Connecticut Department of Economic and Community Development; Kanni Wignaraja, director at the U.N. Development Operations Coordination Office; Jessica Scott, education manager at the Sustainable Development Solutions Network; and Joe DeLong, executive director of the Connecticut Conference of Municipalities. Local leaders also plan to attend the conference as well, including Fairfield First Selectman Mike Tetreau, Darien First Selectman Jayme Stevenson and Ridgefield First Selectman Rudy Marconi. Stevenson, who recently announced her bid for lieutenant governor, said she’ll be taking part in a panel discussion about different sustainability projects from several towns that will be presented like a case study. “I’m really interested in learning about what other towns do and best practices and things we might be able to do locally that don’t cost money and maybe save money,” Stevenson said.